ATLANTA— Tift County was recognized with the Golden Radish Award, a prestigious state-wide farm to school distinction which acknowledges the outstanding leadership of school representatives building comprehensive farm to school programs. 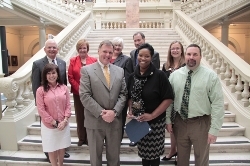 The school district was one of 30 honored at the state capitol for this extraordinary work by State School Superintendent Dr. John Barge, Commissioner of Agriculture Gary Black, Public Health Commissioner Dr. Brenda Fitzgerald, and Georgia Organics Board Chair Mandy Mahoney. •	Locally grown food items were featured in school meals 10 times as part of the district’s three-week menu rotation to promote farm to school each month. •	There are three schools in the district with edible raised bed gardens. Items grown include bell peppers, cucumbers, peanuts, and corn. •	Teachers incorporated farm to school into eight lessons. School districts across Georgia are using farm to school programs to teach core curriculum, support their local economies, fight obesity and other preventable, food-related diseases, and increase the amount of local food they serve to their students. The 2014 Golden Radish Award recognizes school districts for all aspects of farm to school during the 2013-2014 school year—from local food procurement to hosting taste tests to gardening with students—and is awarded at Gold, Silver, Bronze, and Honorary Levels to districts with varying levels of farm to school programs. The award publicly recognizes and honors school districts for their hard work in the variety of farm to school programs they offer students. Districts were evaluated on their work in ten different activities of farm to school.